Developer Babak Yaghoobi has updated his DPF Native IOS control suite (DPF IOS) to support Delphi XE8 Firemonkey. In Firemonkey most controls are drawn by Firemonkey in OpenGL/DirectX which makes them usable across Android, IOS, OSX, and Windows. Delphi XE8 has increased support for native IOS controls (like TEdit) with it’s ControlType property but DPF IOS offers a full native IOS only control suite. With the DPF IOS native controls you may get some additional functionality but you lose the cross platform advantage. You also can not mix DPF IOS controls and visual Firemonkey controls on the same form. The new Delphi XE8 ControlType functionality does allow you to mix FMX and native controls within the same form. You can however mix FMX drawn control forms and DPF IOS drawn forms within the same application. For example, you could have a DPF IOS form for just accessing the native camera and the rest of your app is built using FMX controls. DPF IOS comes with over 90 different demos for using the native control suite and a massive amount of source code for all kinds of integration with IOS functionality. Even if you don’t use the native controls there are all kinds of utility functions and other examples of how to access Objective C code from Object Pascal. Additionally, there is integration for the following frameworks: AddressBookUI.framework, AddressBook.framework, iAd.framework, EventKit.framework, GameKit.framework, MapKit.framework, MessageUI.framework, MobileCoreServices.framework, QuickLook.framework, SystemConfiguration.framework, Social.framework, StoreKit.framework, and WebKit.framework. We’ve covered DPF IOS for previous versions of Delphi as well. The DPF IOS control suite is free and open source. You should also be able to use DPF IOS with Appmethod. 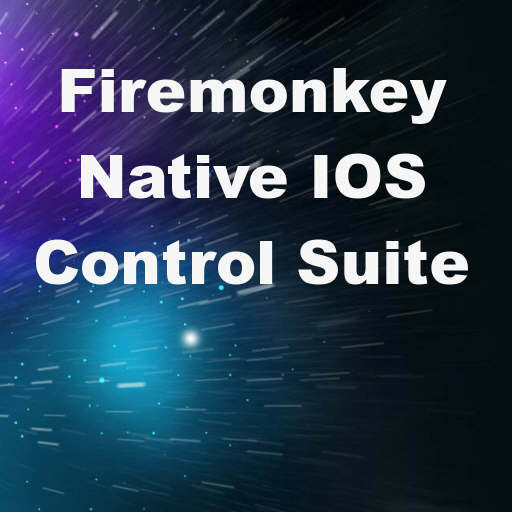 Head over to SourceForge and download the full DPF IOS control suite for Delphi XE8 Firemonkey.